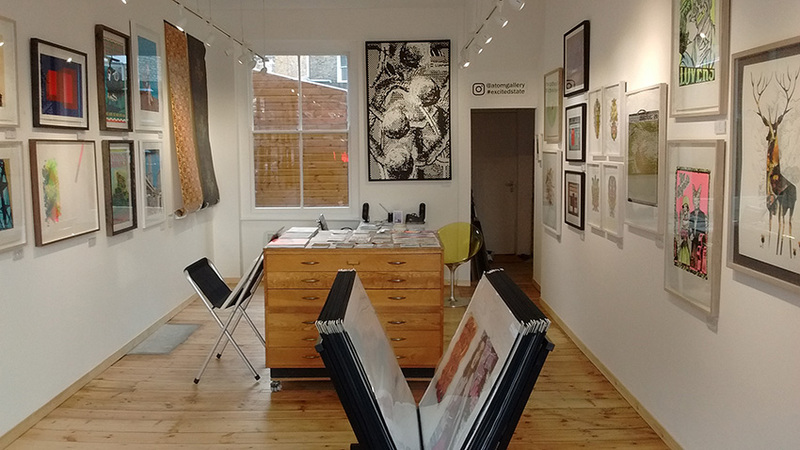 Atom Gallery – Contemporary art gallery in North London, specialising in affordable limited edition prints and hosting regularly changing exhibitions. Atom Gallery is a contemporary art gallery in Stoke Newington, North London, straddling the border between Hackney and Islington. The gallery specialises in limited edition prints of all kinds – screenprints, relief prints, monoprints and digital (giclée) prints – all for sale at affordable prices. We are open every week from Wednesday to Saturday 11-6pm. Please contact us to make an appointment outside our usual hours. The gallery is wheelchair accessible and is on one level – we have a ramp and double doors for wheelchair access. We regularly host exhibitions, showcasing work from both new and established artists and printmakers. While our focus is on print work, we also occasionally show artists working within other disciplines. You can read about our current exhibition, or view details of forthcoming and past exhibitions. The basement print studio is home to Atom Printing who offer a professional screenprinting and digital ‘giclée’ print service. Full details of the service we offer and prices can be found on the Atom Printing website.